Westfield complexes of Galleria, Carousel, Innaloo and Whitford City. Melville Hockey Turf – planning, design, documentation and contract management for the new state-of-the-art artificial wet turf at Morris Buzzacott Reserve in Kardinya. The facility remains the only local community club turf in Western Australia. Bunbury Hockey Turf – civil design and contract management for the removal of an old sand-filled turf and construction of a state-of-the- art artificial wet turf at the Bunbury Hockey Centre at Hay Park. 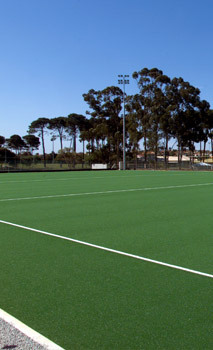 Aquinas College Turf – assisted the Aquinas Hockey Club with the design and construction of a state-of-the-art artificial playing surface at Aquinas College. The facility has received high commendation from the hockey fraternity. Carramar Oval – undertook the design and construction management of the new combined school/community-use grass playing fields associated with the Carramar Primary School.